Ligaments are tough bands of fibrous tissue that connect bone to bone and provide stability to the joints. There are Four Ligaments involved in the Knee Joint. Two Ligaments are present inside the Knee Joint (CRUCIATE LIGAMENTS) and two Ligaments are present on the outside (COLLATERAL LIGAMENTS). The Posterior Cruciate Ligament (PCL) lies just behind the ACL and similarly connects the Femur and Tibia but runs in a different direction. The PCL is the primary stabilizer of the Knee and the main controller of how far backward the Tibia moves under the Femur. This motion is called Posterior Translation of the Tibia. The Collateral Ligaments are extra-articular (outside the Knee Joint). The Medial Collateral Ligament is present on the inner side and Lateral Collateral Ligament is present on the outer side of the Knee. The Medial Collateral Ligament (MCL) connects the Femur to the Tibia and provides stability to the inner side of the Knee. Injuries to the MCL are usually caused by contact on the outside of the Knee and are accompanied by sharp pain on the inside of the Knee. 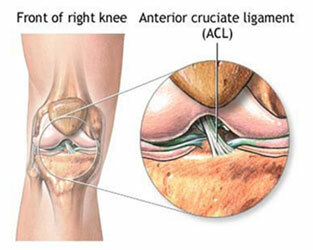 Being fairly large and vascular, the Medial Collateral Ligament has an excellent ability to heal. The Lateral Collateral Ligament (LCL) connects the Femur to the Fibula and stabilizes the outer side of the Knee. Injury to Lateral Collateral Ligament: (LCL) occurs when the force is applied to the inner part of the Knee and the Knee buckles outwards.